Henselt concerto in this country, and from whom she received some valuable ideas about technic. After this she spent two years at the Leipsic Conservatory, studying with Dr. Papperitz, Herr Wenzel, and Kapellmeister Reinecke. On account of ill health she was not able to take part in any public performance in Leipsic. Indeed, her early years were a constant struggle with ill health and weak eyes,— the latter the result of a fall in babyhood into a bed of burning coals. 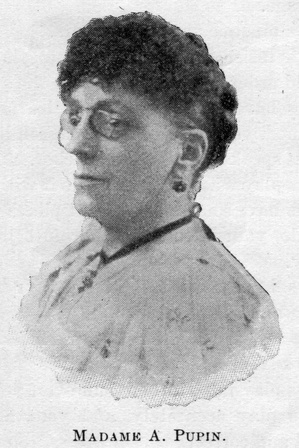 After her return to this country, Madame Pupin established a Conservatory of Music at Elizabeth, N. J., which showed some marvelous results, on account of the unique and original method of teaching, but which she was obliged to relinquish, after five years of successful teaching, owing to continued ill health. She removed to New York City, where she found the health she had never known in youth. In the midst of her busy life, Madame Pupin has found time to write several books. She was the first lady in this country to play the new Janko keyboard in public, and she will be heard in a lecture and recital in the coming meeting of the Music Teachers’ National Association. “All people think, I suppose, do they not?” asked the pupil. “Learn to think, observe, reflect; learn to direct your thought so that you think exactly the same thought at each repetition of a passage: so concentrate your mind on the music that the printed page may stand out before your mental vision, recalled at will. It is strange that so few persons give time and attention to the cultivation of forethought, which is the ability to foresee the result of certain acts. The man or woman who is calm, deliberate and graceful exercises this faculty. The study of technic is the practice of forethought till thought is unnecessary, and the result is that repose which gives such a charm to some piano playing. If you would not be like the five persons I described, you must learn (1) to control thought, i. e., decide what you will think; (2) to invite one thought into your mind and dismiss all others; (3) to turn a thought over and handle it as you will, and not be led by it; (4) to cultivate forethought; and (5) to think your own thoughts, made yours by reason and reflection, and not to accept the opinions of others without weighing them. You are reading Third Prize Essay. Learn To Think - By Madame A. Pupin. from the July, 1897 issue of The Etude Magazine. Second Prize Essay. Child Nature - BY E. M. SEFTON. is the next entry in The Etude.